The first thing I do when I come down to the computer each morning is read the email that’s piled up overnight. More precisely, I sort of mindlessly click through and delete the 90% of it that’s either spam, PR drops, announcements from politicians, or other related dreck. I was doing that this morning when my eyes lit on the phrase “lambasted the tilted playing field that benefits Wall Street banks over Main Street banks.” My fingers stopped. Tell me more, internet! 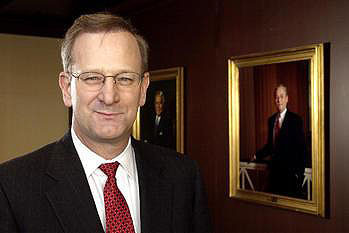 ….Hoenig isn’t just any reformer — he’s the longest-serving Fed policy maker; a voting member of the Fed’s main policy-making body, the Federal Open Market Committee; and his credentials as a deficit- and inflation hawk are unparalleled. “The simplest is: What is your total assets and what is your equity capital, and what’s that ratio, and what’s the maximum we should allow it to be? Should it be 12 or 14 or in some instances 15? We can have that debate either through the legislative process or though the regulatory process with comments and then come to a rule that is binding and cannot be exempted under any circumstance. ….”The max should be — and this is based on my experience, I haven’t done the studies, so I have to put that caveat in there — if a bank has a 12-to-1 leverage ratio, total assets to equity, that’s a fairly good operating level if you look across the country. So I would be inclined to put 15-to-1 as the max, so that in a growth environment you could get to 15, but not beyond that. That becomes a constraint, and I think it would work over time. You would get some blame during the boom that you’re inhibiting growth, but that means you’d have to bring capital to the table and that would be strong. Obviously Hoenig isn’t exactly bowling over the world with his views yet, but it’s nice to see that there are at least a few people in real policymaking positions who seem to get this stuff. Hoenig’s approach to leverage, I think, is exactly right: keep it simple and keep it blunt. The only thing he doesn’t mention here is the need to apply these kinds of blunt limits to the shadow banking system as well as the conventional banking system, but I’d be surprised if he doesn’t believe that too. Is there any way we can appoint him dictator for a day?